Fix to the background backup facility which caused it to get stuck in certain situations. Fixed issue that prevented users from manually uploading a picture from the "View Pending Uploads" page - I'm very sorry this has been present for so long. Took a while to realise what was the problem but thank you to everyone who sent error logs. 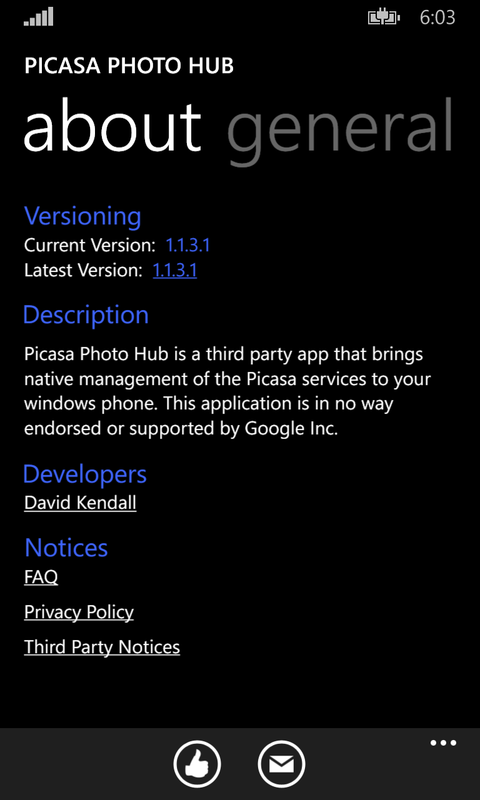 You might also notice that the application has had a change of name to Picasa Photo Hub. Don't worry, I haven't dropped the back up facility. Unfortunately, Microsoft insisted on me updating the name of the application because the metadata data didn't "represent its source, functionality, or features". After contacting Microsoft about this vague failure, they pointed me to the app naming section of a blog post that someone had posted 3 months before the first version of my application even hit the store. Turns out, I wasn't the only victim of this either. Unlike them however, I fought and lost with a name that had as little departure as possible. But, for now, they're happy with the new name. All I can say is, I think for a company that is struggling to keep developers, things like this don't help. I would understand the failure if the application was new, but as it had been on the store for ~5 months with an average rating of just under 4 stars, I don't think people had a problem with the name. Hopefully with the next update I won't get this problem again. Speaking of the next update, I'm about to start the next update which will include some more bug fixes, along with some plumbing work in preparation for the future of the application and platform. Hopefully this update will be out by the beginning of march.